After two years of research and modeling by leading scientists at the University of Technology Sydney, the German Aerospace Center, and the University of Melbourne, a groundbreaking new framework offers a feasible roadmap for achieving–and surpassing–the targets set by the 2016 Paris Climate Agreement. This research effort was funded by the Leonardo DiCaprio Foundation as part of its new One Earth initiative. The research produces the most detailed energy model to date, with 72 regional energy grids modeled in hourly increments through 2050, along with a comprehensive assessment of available renewable resources like wind and solar – and configurations for meeting projected energy demand and storage most efficiently for all sectors over the next 30 years. 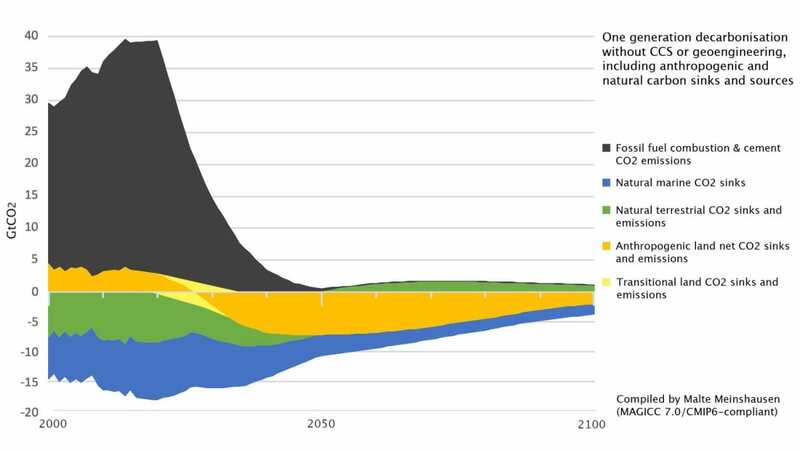 One generation decarbonisation without carbon capture and storage (CCS) or geoengineering, including anthropogenic and natural carbon sinks and sources (Credit: Malte Meinshausen, One Earth Climate Model, 2019) Click on image to enlarge. The proposed energy transition outlined in the climate model is estimated to cost approximately $1.7 trillion per year. This sounds like a lot, but it pales in comparison to the vast subsidies that governments currently provide to prop up the polluting fossil fuels largely responsible for climate change, estimated at more than $5 trillion a year – $10 million a minute, every day, according to the IMF. The research tells us that we could be creating the clean energy future we so desperately need for one-third of the cost.